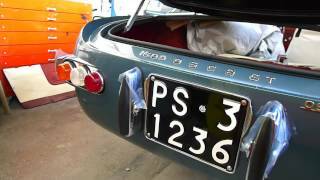 The chassis number 0014 in one of two prototype OSCA 1600 GT bodyed by Touring Superleggera in the 1961. The 1600 is the first and unique road car built by the Fratelli Maserati make, that in the ’50s is exclusively dedicated to race cars. This sporty model is bodied by Zagato, Fissore, Boneschi and by the historical coachbuilder Touring of Milan. Built using the "Superleggera" technique, this 1600 has some highly innovative solutions, like the concave rear window, which should ensure a better luminosity and a better aerodynamic, and a particular mechanism to estract the spare wheel, stowed behind the seats, from the passenger door. It seems that this Touring bodied Osca has been built in only two examples that both still exist. This one, with the chassis number 014 is the car exhibited at the Turin Motor Show in 1961, when this version is showed for the first time.